This thought comes from a Christian Theologian who died in 1328. It is as promised a way to bring control to your mind as well as joy to your life. Whatever our faith may be we often seem most inclined to pray when we are in peril or in need of something. How many of us can honestly say we make a daily habit of taking time out of our busy day to pause and just say thank you to God, the universe or whatever our faith may lead us to? Even those like myself, who have witnessed the amazing power of gratitude do not do this often enough. This is my challenge for you today, take no more than 5 minutes in a quite place alone and say thank you for all you are grateful for. While you are doing so I would like you to think and feel the gratitude of what you are being thankful for. What if you can’t find 5 minutes worth of things to be thankful for? That’s ok, just focus on the one or two things for 5 minutes. Notice when you are done how you feel. You can even try this in the restroom at work on a stressful day. Try it before bed and notice how sound you sleep. Try it as soon as you wake up and see what kind of feeling follows you all day long. No matter what faith you follow, the words of this Christian theologian can serve you well. 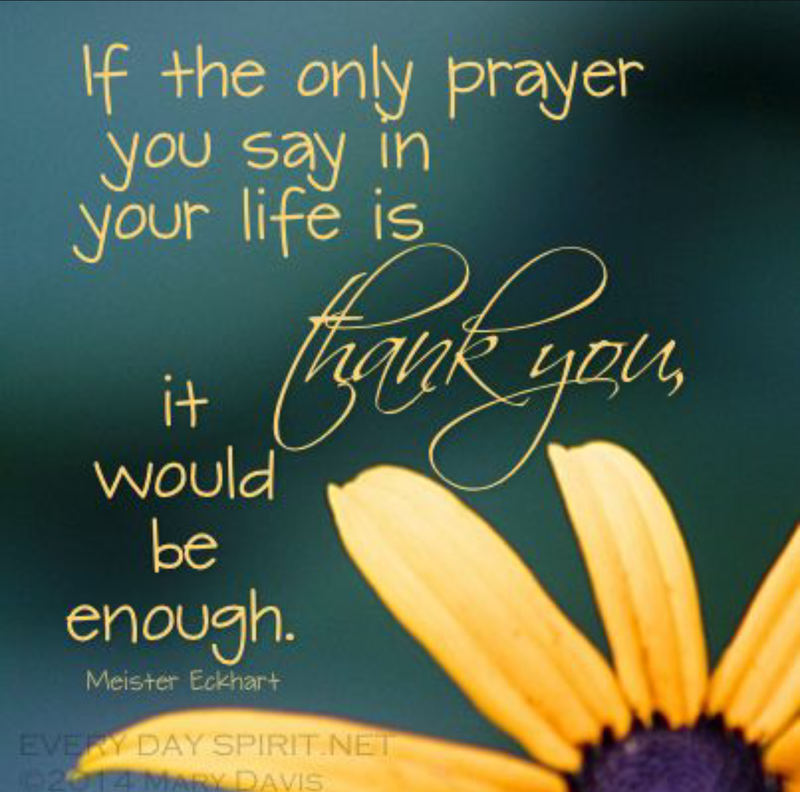 Remembering to offer thanks for what we do have instead of requests for what we don’t can change our lives immensely.